Happy New Year from St. Louis University!! 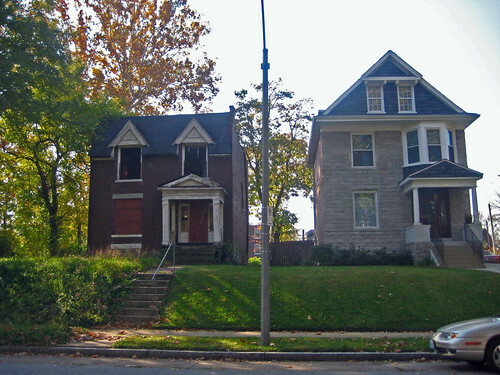 4056 Washington Avenue survived 117 years as its surrounding neighborhood thrived, declined through the middle of the last century, began to revive on blocks to the west, south and north. 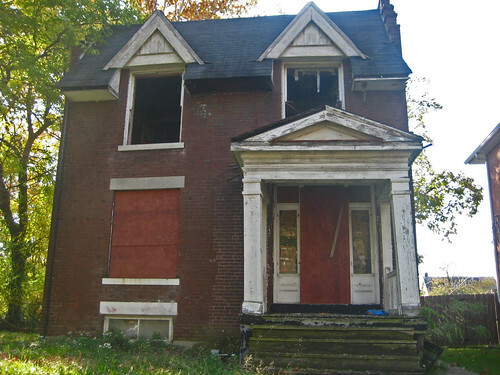 The mansion received what seemed to be salvation as a former owner took it from the state of derelict rooming house with an almost complete renovation, but it would not survive even two months under ownership by SLU. 2005 was a year that must have left Morton D. May rolling in his grave. 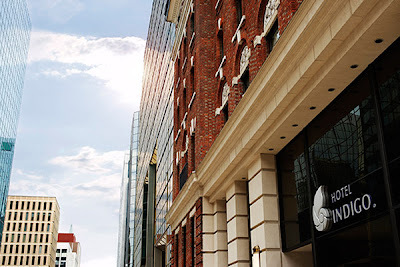 In February, the May Company's longtime arch rival Federated Department Stores announced that it would acquire May for $11 Billion. Several years of flagging sales due to the company's inability to adjust and adapt to the new realities of retailing in the new millennium left it vulnerable to takeover. More than three years later, The 21 story Railway Exchange Building, May Company's former headquarters stands dark and empty above the seventh floor. 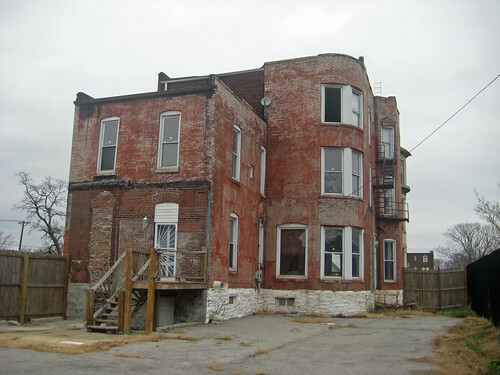 Fortunately, the building is in no danger, and in fact was added to the National Register of Historic Places earlier this year. 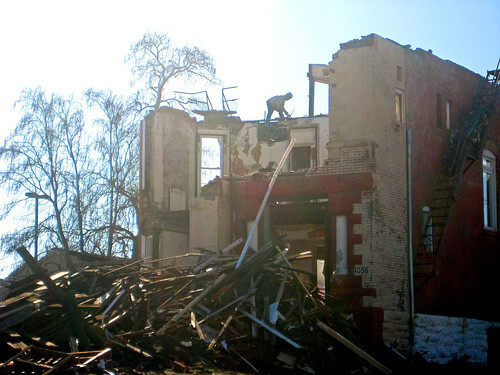 Just a few months after the downfall of Morton's namesake company came the destruction of his Ladue estate. 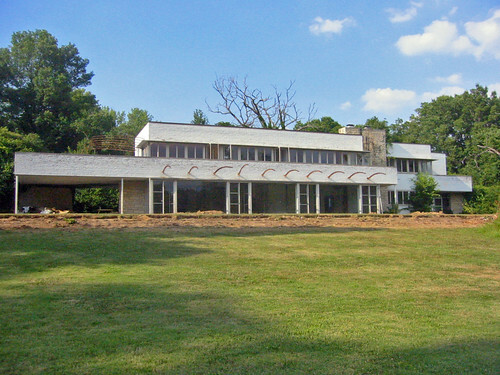 Lost was undoubtedly one of the most significant examples of International Style architecture in St. Louis. Built in 1941, the home was designed by Samuel Marx, a successful Chicago architect and furniture designer who was May's uncle by marriage. 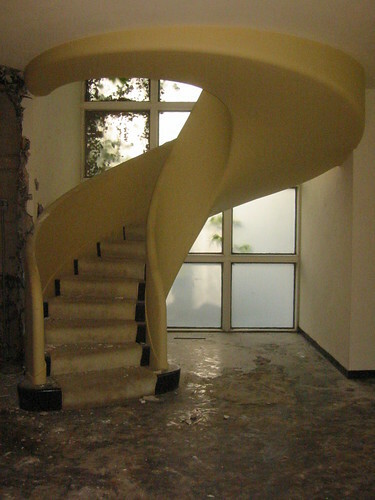 Besides architecture and furniture, Marx was an avid art collector and influenced May in building his own collection. 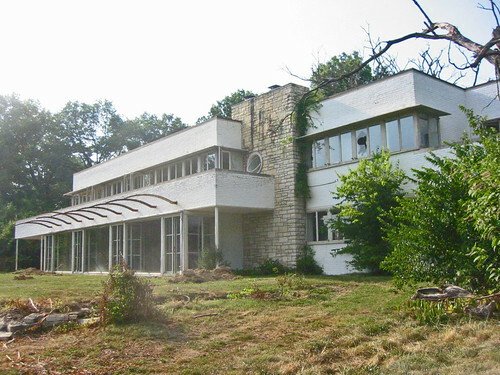 The home was demolished by Felix and Susan Williams, owners of The Screening Room in Frontenac so that they could build a new Super-size McMansion with a total living area of almost 19,000 square feet according to St. Louis County records proving that no matter how many truckloads of money you have, you cannot buy good taste. 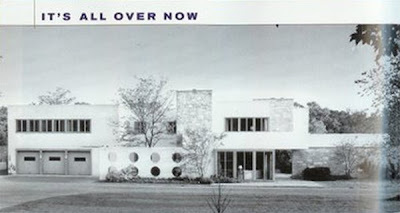 According to the Post-Dispatch, this atrocity was not the Williams first crime against modern architecture. 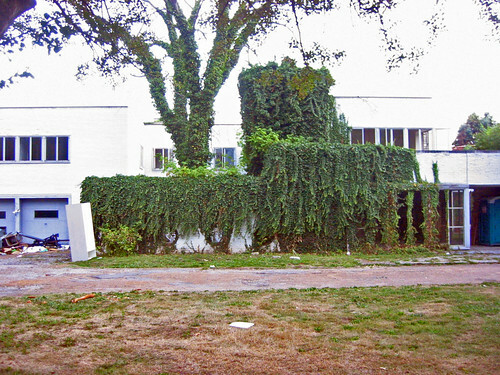 In 1999, they bought and demolished a neighboring Harris Armstrong house and had it demolished simply so that their existing home would have a bigger yard. So next time you need to put a home theater in your basement, go to Hi-Fi Fo-Fum instead of the Screening Room. The Williams are not the only ones to blame though. 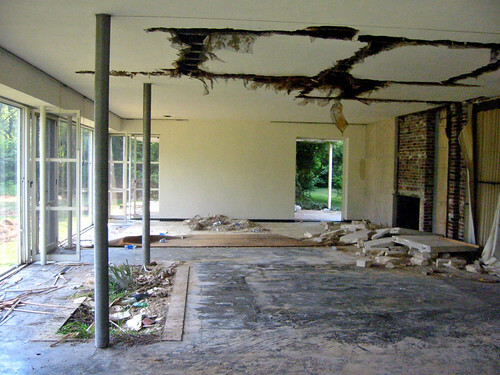 The 9 acre property had been marketed and was sold by real estate agent Anne Ryan as a teardown. 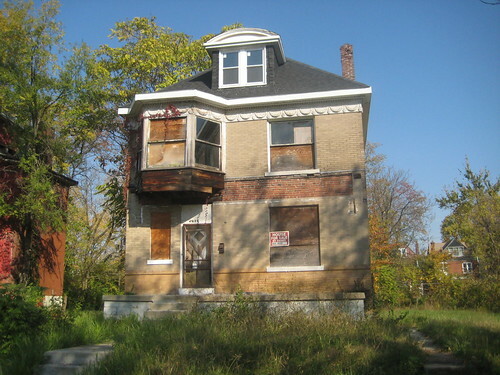 Unfortunately there is a self-perpetuating fallacy amongst narrow minded real estate agents in the area that there is no market for modern homes in St. Louis. This small-minded thinking has led to the destruction of dozens of mid-century modern houses in the last decade. 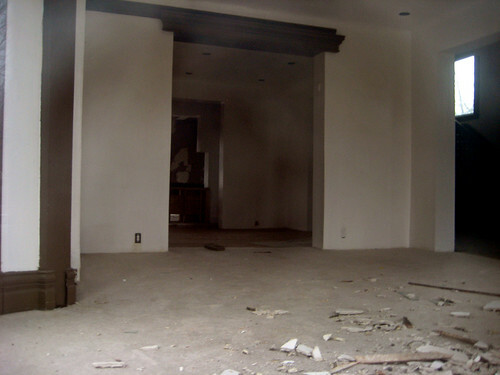 When I heard that the homes days were numbered on a whim I grabbed the video camera in addition to my still camera. Below are two video segments documenting the estate. As you may gather from the video, I was almost as awe struck by the home's siting on its 9 acres of ground as I was with the home itself. To see more photos of the home, check out my set on Flickr. All is not lost though. Morton D. May left an extensive legacy with his art collections which he generously gifted to the St. Louis Art Museum, Washington University's Gallery of Art (now the Kemper Museum). Over the years, SLAM was the recipient of over three thousand works of art including the majority of its Pre-Colombian collection and its renowned collection of German Expressionists including Max Beckmann, Wassily Kandinsky and many others. May was also instrumental in the construction of the Gateway Arch president of the Jefferson National Expansion Memorial Association. While Famous Barr is history, Macy's is still open in the original store Downtown, and has so far remained committed to keeping its presence there. This year more than any, the Downtown store could use your patronage, so if you have an urge to hit the post holiday sales, skip the mall and head to 6th & Olive. If you are there around lunch time, Papa Fabar's is still serving on the 2nd floor, and while it may not be as polished as it once was, the St. Louis Room on 6 has a lunch buffet featuring a different menu daily. Thursday's fried chicken and Monday's meat loaf and bread pudding are quite tasty, and yes you can still order the Famous french onion soup in either restaurant. Merry Christmas & Happy Hanukkah. 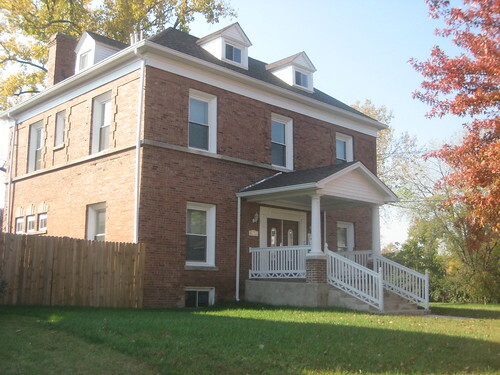 As reported Friday by Eco-Absence, Saint Louis University purchased 4056 Washington Avenue in late October. 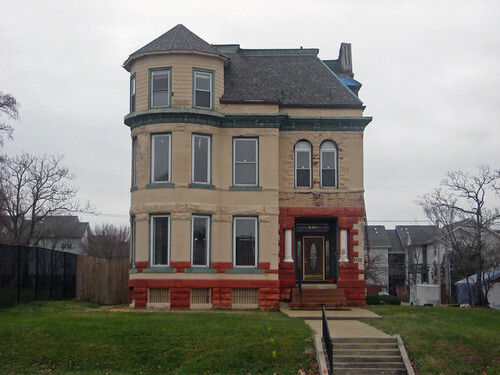 The 5,832 square foot mansion was built in 1891, and is one of the last surviving homes on the block of Washington between Vandeventer and Sarah. 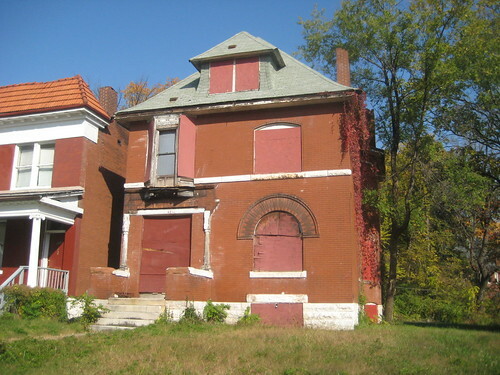 Upon seeing that SLU had acquired the property, the red flag went up in my head, remembering that after they purchased a convent down the street in 2000, they demolished 4040 Washington, a 2 story Italianate home that was vacant but structurally sound and in relatively decent condition. In its place they planted some grass and placed a large wood cross near their ubiquitous black fence. 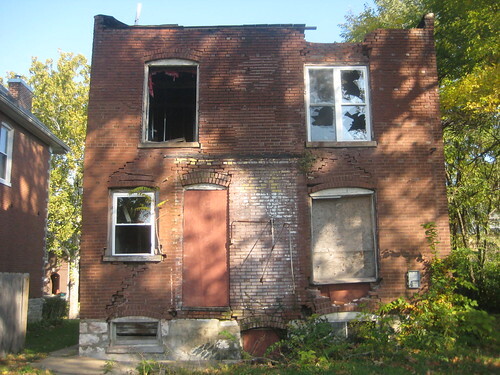 Early this year, in an act seemingly unrelated to anything, SLU demolished the Wagner house at 3438 Samuel Shepard. 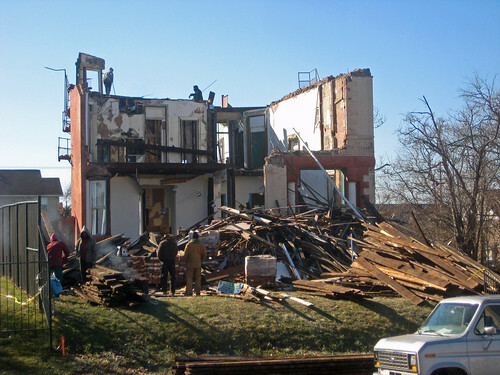 More recently, SLU demolished a large Italianate mansion on their campus to create a courtyard in front of their new law building. I checked the City's online records first to see when the once dilapidated rooming house had undergone a mostly complete renovation several years ago. Record of that permit (if there was one) was missing. 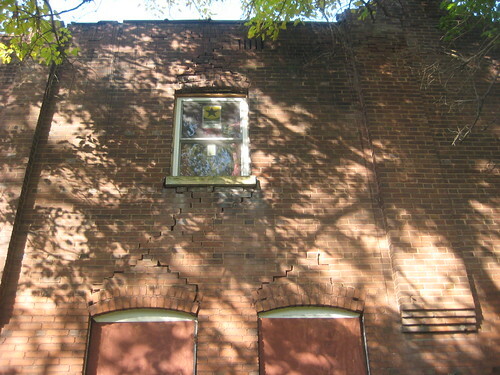 Instead, there is record of a demolition permit dated 12.04.08 that was obviously not carried out at that time. 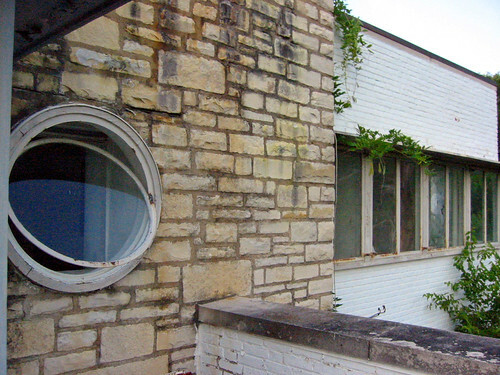 Electrical permits seem to indicate that the rehab took place in 2004. 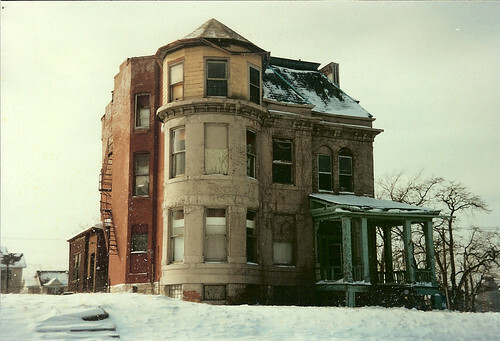 I first noticed this massive home in the early 1990's as I was photographing 4060 and 4064 Washington, both of which were large vacant homes that burned and then were demolished. 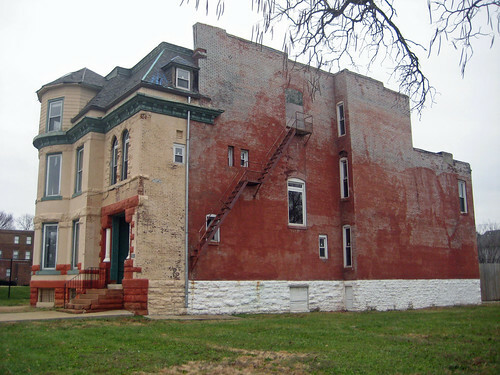 At the time, the mansion was a low rent rooming house in poor condition, and I recall fearing that it might end up in with the same fate as its neighbors to the west. Several years later however, I drove by and the mansion had received a complete makeover including new roof, windows, new paint job (it had been painted previously), I assumed a renovated interior and seemingly new owners that would take care of the building into the future. 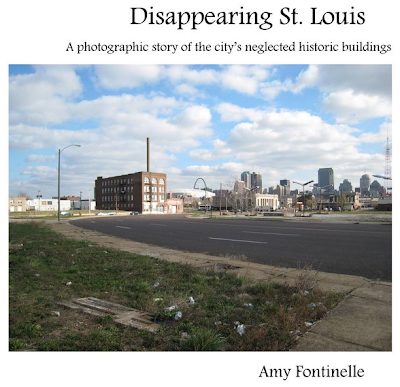 Fast forward to this fall, and the property apparently went into foreclosure with SLU as the new owner. This is yet another case where there is no logical reason for demolition yet SLU steamrolls forward. 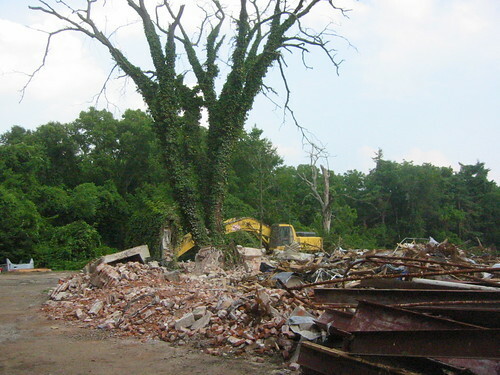 Unless SLU is planning some large new building as part of their retreat complex, demolition is completely senseless. I did a Google search to see if I could find out anything more about the property. I happened to find two videos on Youtube showing the interior of the home. 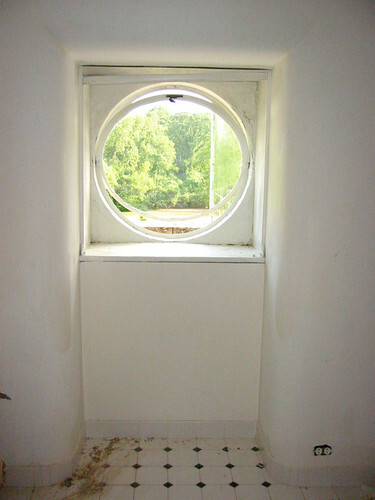 The videos and photos I took through the first floor windows confirm that the building was mostly rehabbed on the interior. While it is evident that some additional work would need to be done, it seemed to be about 75% done. 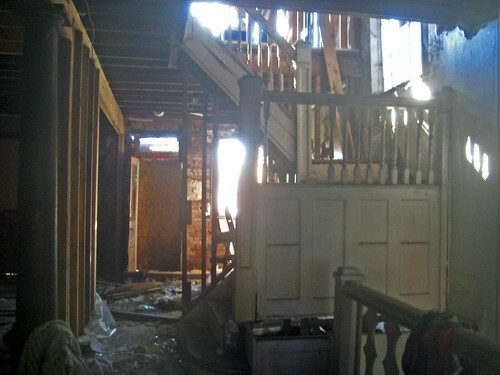 Video of the first floor interior. 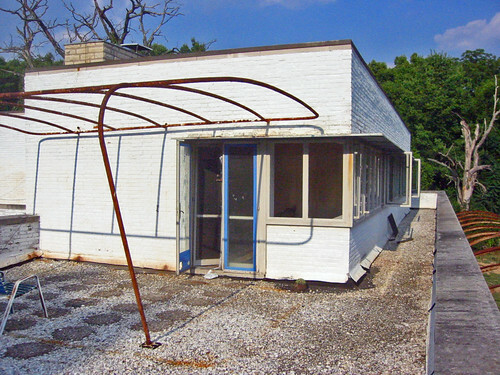 The West End Word reported recently that the any decision by the St. Louis Archdiocese about whether to demolish the San Luis Apartments (formerly the De Ville Motor Hotel) is on hold until a new archbishop is chosen. With income at the Archdiocese way down this year, it is possible a new archbishop would want to reconsider spending a large chunk of money to demolish the San Luis structure and build a large new parking lot that will not produce revenue. 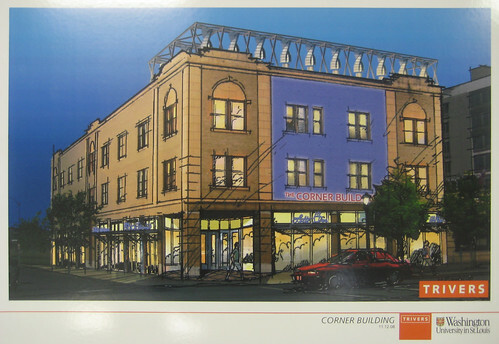 Would the Archdiocese consider selling to a developer? They could potentially stand to gain a windfall if they did. 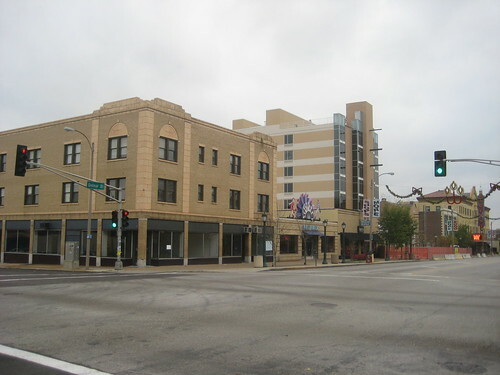 It was reported that the Roberts paid $100 per square foot of land for the formerly tired Days Inn property which they are renovating to open St. Louis' first Indigo Hotel. 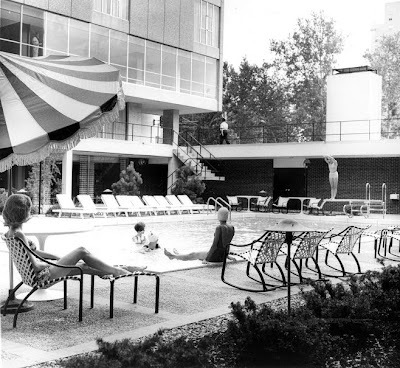 Throughout the country there are dozens of examples of MCM hotel properties that have been either recently renovated or simply well maintained over the years (crazy concept isn't it!) including the Jupiter Hotel in Portland, the Horizon Hotel in Palm Springs, the Washington Plaza in D.C., and the Metropolitan in Midtown Manhattan (formerly the Summit). 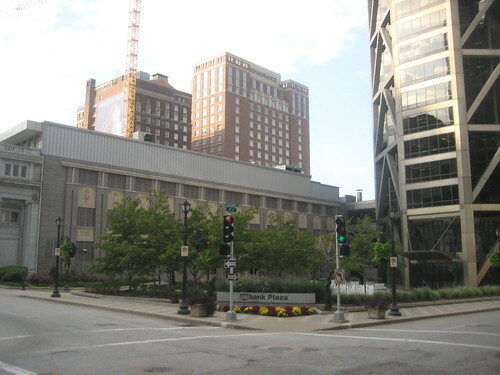 While the economy is down now, it will rebound at some point, and the Central West End will continue to be a very desirable place to stay in a hotel. Alternately the Archdiocese could form a for profit entity to renovate the San Luis (with historic tax credits) for apartment housing. The location is prime for either market rate or low/moderate income elderly apartments, which was the building's most recent use. To learn more about the San Luis, please visit this updated site established by fellow preservationists. The American Association of State Highway and Transportation Officials (AASHTO) is asking for comments (both written or video) about what should be priorities for transportation funding. Go to itoldthepresident.org to submit your comments. 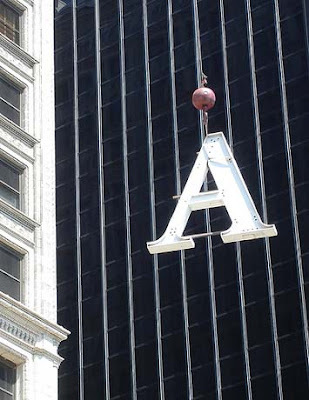 AASHTO is a nonprofit, nonpartisan organization that represents state departments of transportation. They will be collecting comments through January and sharing them with Congress and the White House. According to Tony Dorsey, an AASHTO spokesman, they will "mine the information for patterns ... if we hear a lot of people talk about congestion (or say need for more transit), we'll tell Congress and the (Obama) administration that congestion was their top priority, and they want something done about it". In the last few weeks, there has been much talk of an economic stimulus bill containing tens of billions of dollars for transportation projects. Obama and congress will also need to pass a new transportation bill before federally funded highway and transit programs expire in September 2009. Why am I blogging about this? Because as most of you are probably well aware, transportation infrastructure planning and implementation has profound direct and indirect affects on the built environment. I will be commenting about the need for additional funding for MetroLink expansion and operation dollars as well as the need for the State of Missouri to start bucking up its fair share of the funding pie for transit. Please take a few moments and submit yours. 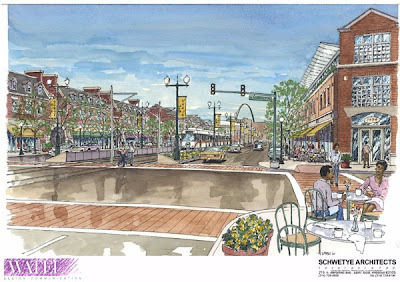 Coming Soon: More Driveways for 10th Street or an active retail corner? 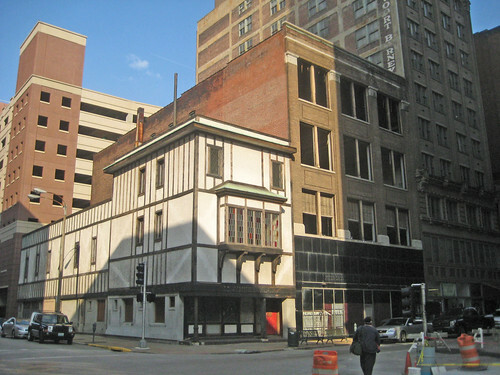 At Monday evenings Preservation Board meeting, the board approved the Robert's Brothers proposal to demolish buildings at 919 & 923 Locust, and proceed with their proposed redevelopment which will feature an Indigo Hotel. What remains to be seen though is what will be built on the site of the demolished buildings. 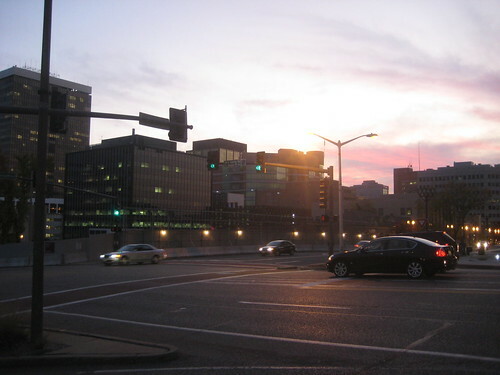 Previously the Robert's Brothers had proposed leaving the corner of site at the intersection of 10th & Locust open for a new semi-circle driveway in front of the new lobby structure. At Monday's meeting however, Virvus Jones of The Robert's Companies and Mike Killeen, the architect for the project presented a revised version of the proposal. 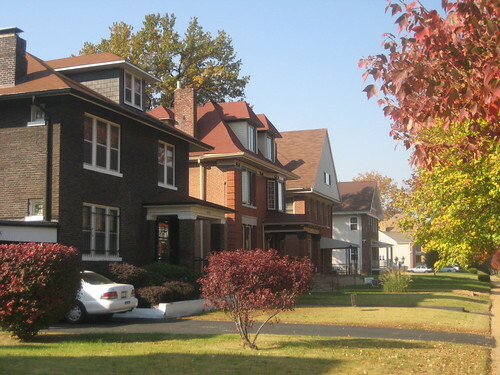 The new version has the driveway covered by a roof and the facade of the new structure continuing to the corner of the intersection along Locust. 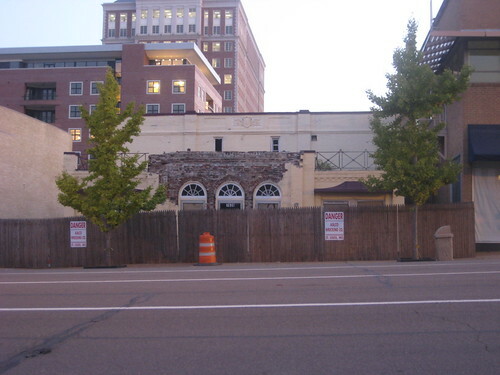 There would be an opening in the facade from the Locust sidewalk to the covered driveway area, and along 10th street the structure would be completely open. While this is an improvement over the initial proposal, it still contains the unnecessary driveway, which leaves the entire 10th street side of the project dedicated to the automobile. 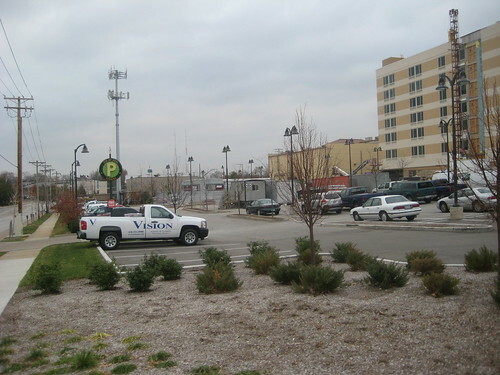 Directly north of the proposed hotel driveway entrance is an alley and the Renaissance Hotel parking garage, which has a large truck driveway leading to the underground loading dock and a pair of driveway entrances for the garage itself. This means if the hotel driveway entrance is built replacing the building at 923 Locust, there will be nothing but solid driveways (and the alley) along the east side of 10th Street from St. Charles Street south to Locust. 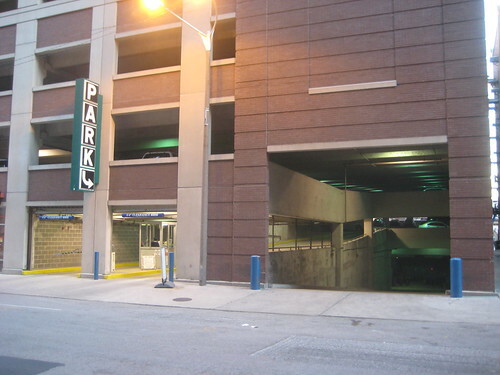 During Q & A after presenting to the board, Virvus Jones explained that parking for the hotel would be had at either the 9th Street garage or the Renaissance garage, but that they did not really expect many cars... so why build a driveway in front of the hotel entrance? Prior to voting, several board members expressed concern about the driveway (having seen photos I supplied of Indigo Hotels in other cities without driveways in front). 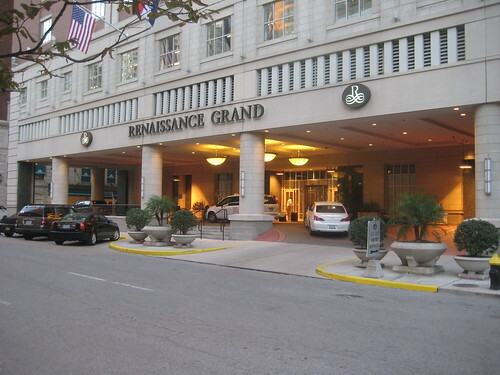 Mary One Johnson however called the large covered driveway at the Renaissance "elegant"! While the Robert's Companies are not bound by law to return to the board with a final design, there seemed to be some indication that might do so voluntarily. After the meeting, Mr. Jones thanked me for my input, and agreed that more retail along 10th Street in place of the driveway would bring more revenue to the project. He indicated that he would talk to the Roberts about the possibility of not doing the driveway. Street. 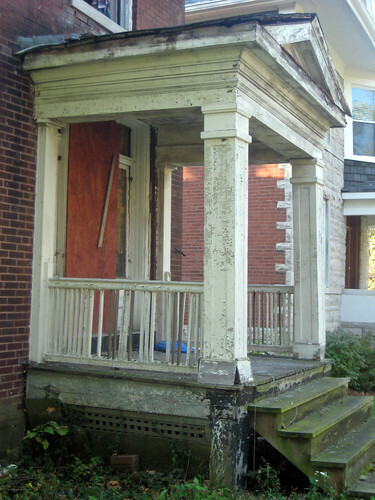 There would be some additional storefront and demising walls needed, but the Driveways do not produce rent income. Also, since the commitment has already been made to roof over the entire site, there is not much added cost to change the driveway space to additional retail. It would simply be a matter of moving the curved glass wall out to 10thadditional retail revenue would outweigh this nominal cost. 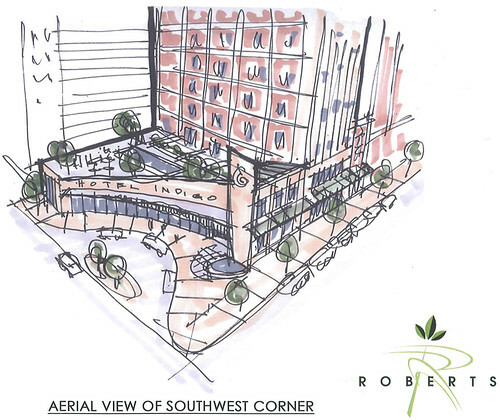 The Robert's have already included retail in their plan, and have the opportunity to build one of the more "urban friendly" Indigo Hotels in the country if they make the right decision and build more retail instead of an auto oriented entrance. 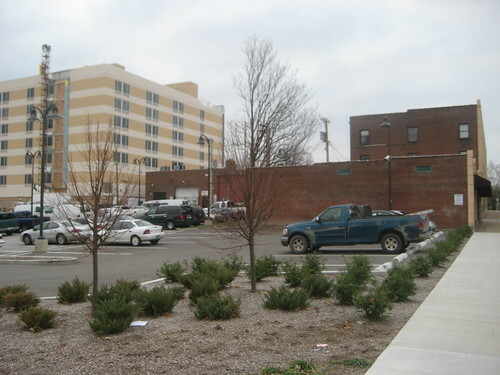 Cutting Corners - Another Driveway Plaza for Downtown? 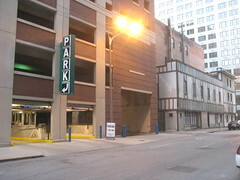 Just a few weeks after the announcement that yet another parking garage will be built Downtown on the site of the current US Bank plaza/driveway at 7th & Locust, The Roberts Brothers are proposing a similar but smaller driveway/plaza cutting away the corner of 10th & Locust just three blocks west. 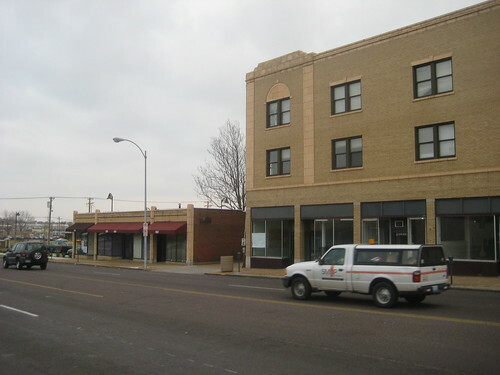 The proposal includes demolition of two buildings at the northeast corner of the intersection. 923 Locust at the corner has a false stucco and half timbered exterior that has been on the building for several decades, and 919 Locust, a four story structure with a buff brick facade which was built in 1916. 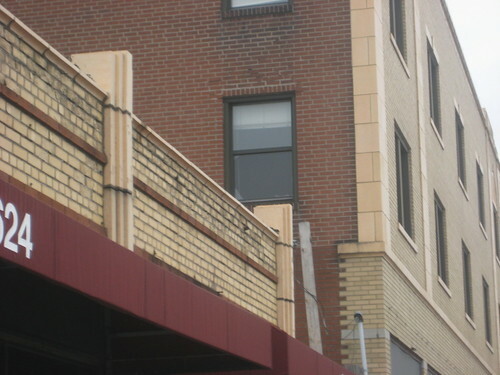 City records list the corner building as being constructed in 1890. 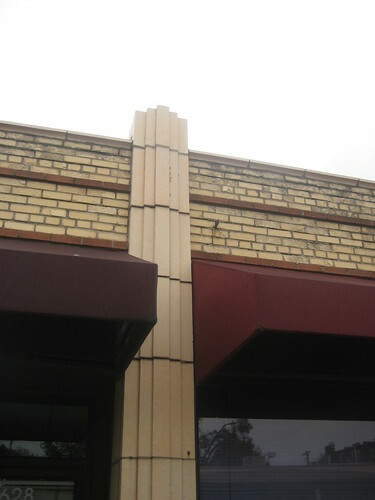 Several cast iron columns which appear to be original are visible at the ground floor. 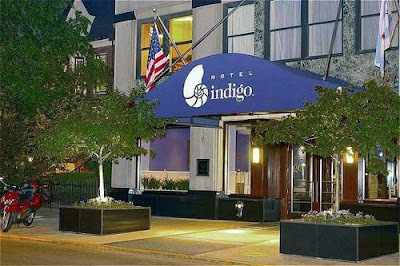 An Indigo Hotel, which is the same flag that the Roberts are using to re-vamp the MCM Days Inn at Lindell & Euclid, would occupy the historic Scruggs Vandervoort Barney Annex at 917 Locust, the small Moderne faced building at 913 and a new two story structure containing lobby would be built occupying the 919 site. 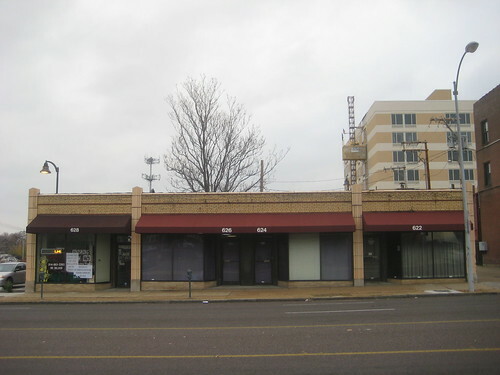 Most of the corner 923 site however would remain un-built and occupied by a circle drive off 10th Street. My issue with this proposal is not preservation of the buildings, it is about urban design. 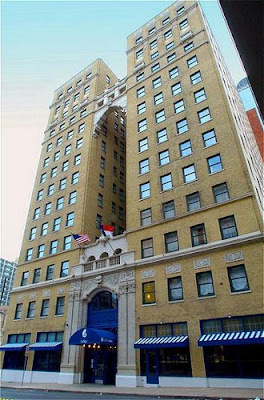 Neither building is of spectacular merit, and while the building at 919 adjacent to what would be the hotel tower in the Scruggs Annex is an attractive building, it's floors are far out of alignment with the Annex, which would make it difficult to tie the buildings together. The issue though is about holding the corner of the intersection in a dense central business district environment. If the proposal called for a new structure built to the corner of the intersection, I would not have a problem with it. 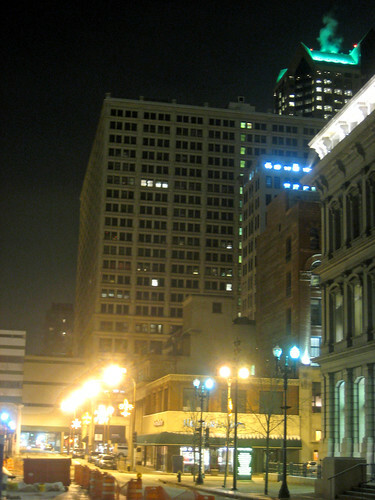 The western half of the CBD of Downtown St. Louis has been so badly eroded by parking lots, plazas, driveways, and needless building setbacks (at&t buildings) that only one other intersection between 8th and Tucker besides 10th & Locust retains four buildings built up to the corner at the intersection. 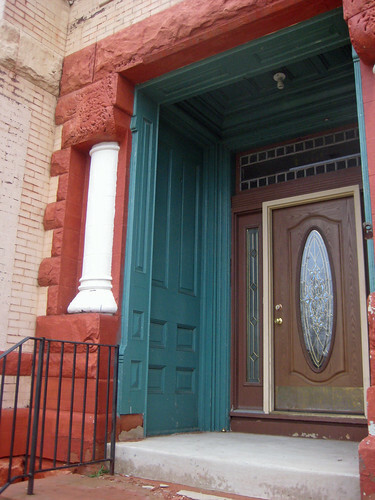 This occurs at 9th & Washington (The Old Post office was historically set back on all sides). This proposal would continue this erosion and set bad precedent for future developments. The proposal is up for review by the City's Preservation Board at their monthly meeting next Monday, October 27th at 4:00pm. 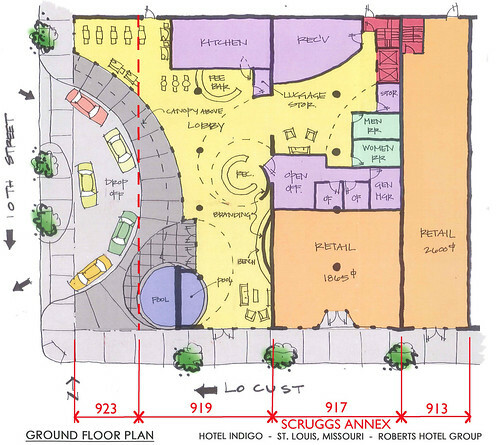 Preservation Board meetings are held at 1015 Locust (one block west of the proposal site), suite 1200. Meetings are open to the public and anyone can sign up to give testimony for or against any agenda item. I encourage anyone with an opinion about this to show up and speak. 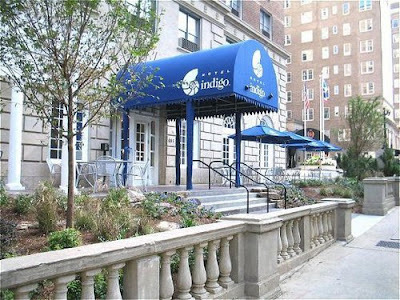 The developer will likely claim that Indigo is requiring the driveway in front of the hotel. 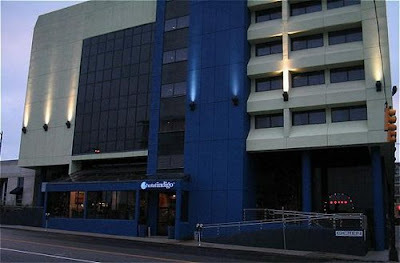 Like many similar hotels in it's class, Indigo's new-build prototype does have a driveway at the entrance, yet in several cities Indigo Hotel's have opened in existing structures, and in one case a new building, which are all built up to the property line without a driveway in front of the entrance. 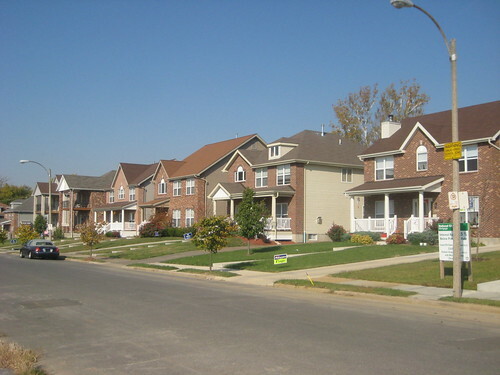 These include: Atlanta; Chicago; Dallas; Nashville; Rahway, New Jersey and Ottowa, Ontario. Don't get me wrong, I would love to see Indigo go into this location, as it would bring desperately needed activity to Locust Street. I feel however that the hotel can be done, and in fact would be better without cutting out the corner of the block for a driveway.